You are reading this because you are right now — or will be shortly — struggling with how to best pay for long term care in a nursing home for a loved one. Do you spend all of their money on the nursing home? Do you give everything away? Is Alabama Medicaid even an option? Join with me on this little journey through Alabama Medicaid. But I noticed that I would be asked about long term care by clients and friends. I was embarrassed to find that I knew nothing about it. I did not even know the difference in Medicaid and Medicare. Realizing I had clients that needed help, I turned to some elder law lawyers. Frankly, I was disappointed. They took a very complicated area of the law . . . and did nothing to make it understandable. It was kind of the old “wizard behind the curtain” strategy. Keep everything mysterious and complicated and you have no choice but to turn everything over to the “wizard” elder law attorney without understanding your rights and options. That was very annoying to me. When I shared this with lawyers who asked me about, for example, Alabama Medicaid, they told me it was the first time they understood it. So I decided to share this with others. That’s how this article came about as even all these years after first learning about Alabama Medicaid, I find lawyers around the country still making it more complicated and confusing than it has to be. 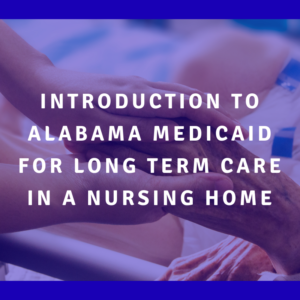 Why is Alabama Medicaid so important if your loved one is facing the nursing home? Because very few families have the resources to pay, month after month, the $6,000 or $7,000 or $8,000 for the nursing home room. A year means getting close to $100,000. Five years and you are pushing half a million dollars. If Alabama Medicaid applies to your situation, then in essence most of your income goes to the nursing home and Medicaid picks up the rest. So if you have only Social Security of $1500 a month, and your nursing home room costs $7500 a month, then Alabama Medicaid is going to cover the $6000 shortfall you have every month. An amazingly helpful benefit for folks who need nursing home care. It is not too late to apply. You may have a loved one who has been in the nursing home for months and maybe you could have successfully applied for Medicaid earlier. That’s ok. What’s the old expression, “The best time to plant a tree is 20 years ago and the second best time is today”. A lot of truth in that. We can’t change the past but we can make the best decision starting today. No, you do not have to give up your home before applying for Medicaid in Alabama! I can’t tell you how many lawyers believe this. Certainly, you will be told this by almost all folks at the nursing home. And by well-intentioned friends and advisors. It is simply not true. Especially for married folks. One stays in the house and the other is in a nursing home. And even for single folks, you can still qualify and own your home. Medicaid may be able to put a lien on it and we’ll discuss that in this article. The timing of when you apply is absolutely critical! We have seen families apply one month too early and that costs them hundreds of thousands of dollars. You don’t want to apply later than you need but nothing is as bad as applying slightly too early and losing everything. So make sure you apply at the right time and you know as much as possible about what will happen before you apply. Think of Alabama Medicaid as a right you have but it comes with rules. Medicaid can save hundreds of thousands of dollars in long term care costs so it is incredibly powerful. But it does have rules. It really is that simple — know the rules, and then take action that stays within the rules. Medicaid looks at three things to see if you qualify for Medicaid to pay the vast majority of your long term care costs in a nursing home. (This is not everything but it is the major factors that affect most folks). First requirement — do you need nursing home care? Usually, this is not a concern. I’ve never known anyone to want to go into a nursing home that does not need it. Instead, we need to but don’t want to go to a nursing home. But technically you must have a medical need to be able to go into the nursing home and you show this to Alabama Medicaid. This is by far the easiest requirement to meet. Second requirement — do you have your assets low enough to qualify? Remember we talked about rules? Alabama Medicaid has rules. Not necessarily the same as the rules for Florida Medicaid or Georgia Medicaid or Tenessee Medicaid. That’s ok. You are in Alabama so you follow Alabama rules. Final thought up front — not all the rules make sense. That’s ok — we are playing this game so we follow the rules. The person going into the nursing home can have $2,000 in countable assets. The key is “countable” as not all assets are countable. So your home is normally not counted. Nor personal possessions (clothes, furniture, etc). Normally your car or truck or van is not counted. Often, prepaid funeral plans are not counted. Even for family members sometimes. You can have a certain amount of life insurance that is not counted. There are others but hopefully, you see the point that not everything is counted. But once we get past the stuff we don’t count, then, in essence, we have to “spend down” the assets to get to that $2000 level. There are ways to do this that comply with the rules. And there are incredibly unwise ways that people are told (even with great intentions) that cause major problems. So you have to spend down in a way that Alabama allows. And if we are married, then we take all of our assets (husband and wife) and total them, and then divide into two. The spouse going into the nursing home must spend down to the $2000 and the other spouse is allowed to keep around $126,000 in assets. The details can get a bit complicated at first but I just want you to understand the basic idea with assets. Third requirement — will you be penalized for giving anything away the last 60 months? Whether you gave away assets a year ago, or as part of a plan to qualify for Alabama Medicaid, the bottom line is you have to bring a “box” with all of your gifts in it. Well, not all of your gifts ever. So when you apply (and are qualified) for Alabama Medicaid, you tell Medicaid about all of your gifts over the past 5 years. Anything you transfer where you don’t get full fair market value back for it. So if I give you a $10,000 car, that’s a gift of $10,000. If I sell it to you for $4,000, and it is worth $10,000, then the gift is $6,000 (difference in $10,000 and $4,000). So Alabama Medicaid totals up those gifts and divides by $6,200. ($6,200 is the designated average cost of a nursing home — it is not really but that’s the number we use. Remember, we follow the rules). Let’s say you gave away $62,000 in assets. Divide that by $6,200 and the answer is 10. 10 months that you are penalized and have to pay for your own nursing home. What if you gave away $186,000 in gifts? Then the math is $186,000 divided by $6,200 which is a 30 month penalty. So what do you do next? Two options. Keep in mind there are more things than we discussed — the above is just an introduction. 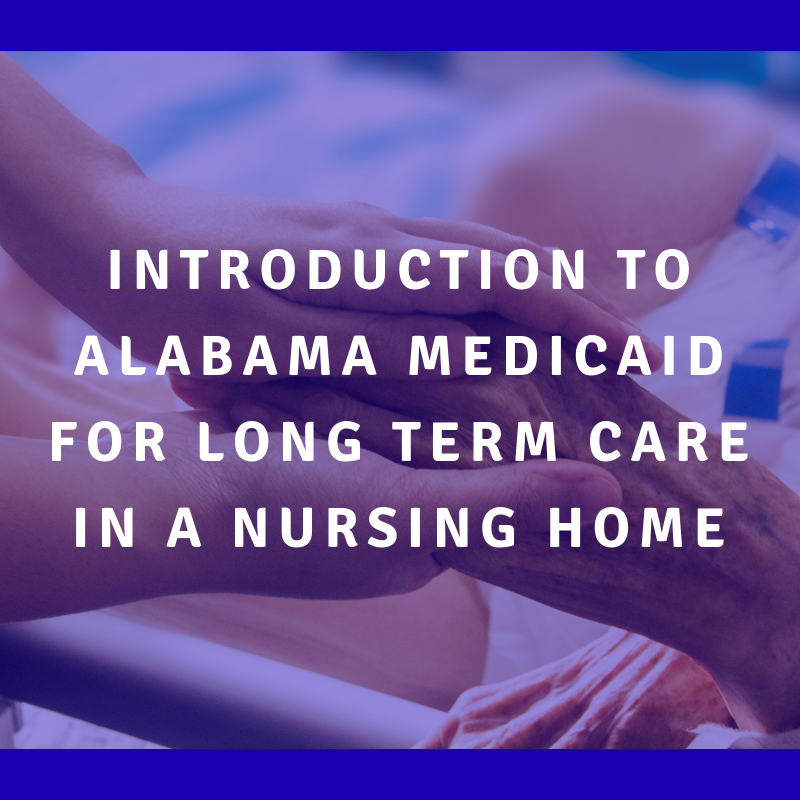 You can find lots of articles here that discuss various aspects of Alabama Medicaid. You can do this yourself. It is possible to research the rules. Then determine how to apply them. And you move forward with applying for Alabama Medicaid. This is certainly an option. You (hopefully) save money by not paying a lawyer. You will definitely spend a lot of time. And if you do it wrong, it will cost you a lot of money. The other option is to hire a lawyer who can explain your choices in an easy to understand way. This will save you time and will cost you money. And you would certainly expect to gain peace of mind. So what’s the right decision for you? Some folks prefer to do things themselves and with the internet, you can research a lot of information, some of which is even accurate. Others prefer, particularly in stressful times, to have a guide who knows the way and can show the best path to get from here to the destination. Whichever option you choose, I wish you only the best! PS — if you would like to chat with me, call us at 205-879-2447 or fill out our contact form and we’ll get right with you.